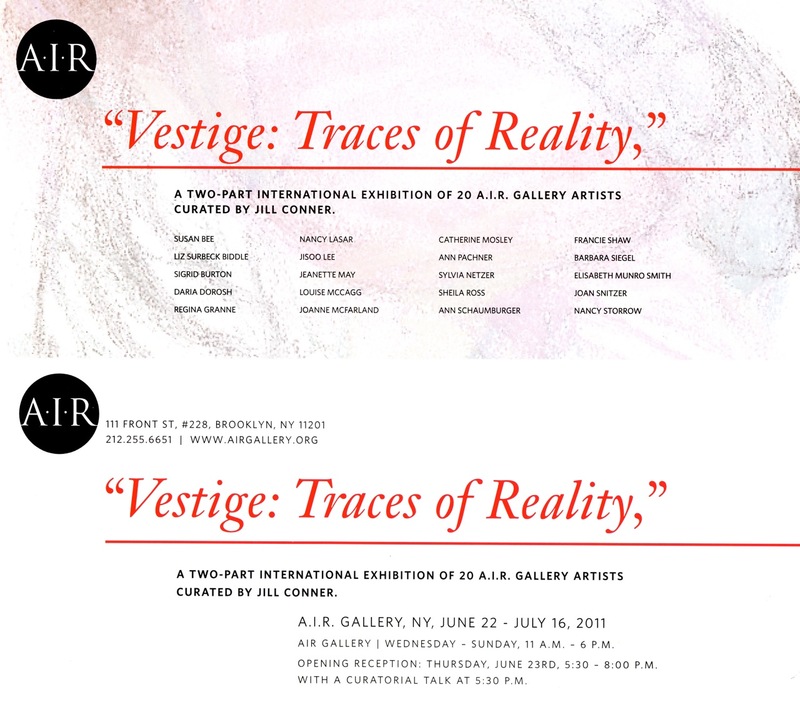 “Vestige: Traces of Reality,” a two part exhibition at A.I.R. Gallery and Konsthallen, Sandviken, Sweden. The exhibition is curated by New York based critic and curator, Jill Conner and includes the work of 20 A.I.R. Gallery artists. The opening reception at A.I.R. Gallery will be held on Thursday, June 23 from 5:30pm to 8pm, with a talk by the curator at 5:30pm. Since 1976, only two years after A.I.R. opened its doors, the gallery has presented groundbreaking exchange exhibitions with groups of international women artists from France, Israel, Japan, Hungary and Sweden. Following last year’s exhibit of Swedish women artists, A.I.R. Expedition Sweden, the gallery is now pleased to offer the companion exhibition, Vestige: Traces of Reality. Artists included in the exhibition: Susan Bee, Liz Biddle, Sigrid Burton, Daria Dorosh, Regina Granne, Nancy Lasar, Jisoo Lee, Jeanette May, Louise McCagg, JoAnne McFarland, Catherine Mosley, Ann Pachner, Sylvia Netzer, Sheila Ross, Ann Schaumburger, Barbara Siegel, Francie Shaw, Elisabeth Munro Smith, Joan Snitzer and Nancy Storrow. About the curator: Jill Conner is an art critic and curator based in New York City. She is currently the New York Editor for Whitehot Magazine and writes for other publications such as Afterimage, ArtUS, Sculpture, and Art in America.